Way back in the day - we're talking thousands of years here - chocolate was consumed via drink by the Aztecs. They thought it was magical, that it would give them powers, and that it was suitable for their most sacred rituals. Even the Latin name for the cocoa tree, Theobroma cocoa, tells of its mythical powers as it translates into "food of the gods." 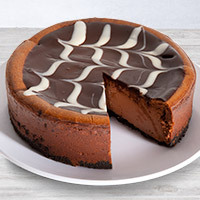 Knowing how delicious chocolate has been thought of for centuries, we decided to make a chocolate dessert that would make the ancients proud. 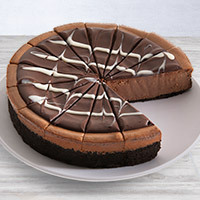 While our Triple Chocolate Cheesecake doesn't deliver divinity, its rich taste is certainly nothing less than magical.